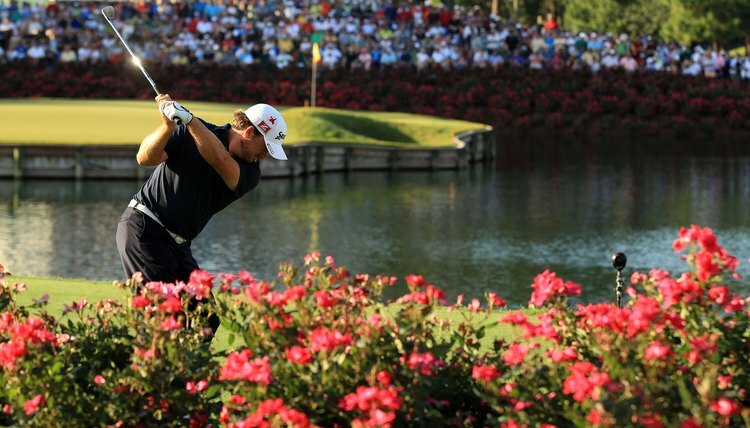 Graeme McDowell hits from the drop zone at the 17th hole of the 2011 PLAYERS Championship. When a golfer hits a ball into a water hazard he typically proceeds under Rule 26-1 of the U.S. Golf Association’s Rules of Golf. The player drops a ball behind the hazard, no closer to the hole, keeping the point at which the ball entered the hazard between the drop area and the hole. In some cases, dropping a ball in the usual manner isn’t practicable, so designated drop zones may be established. The Rules of Golf define "dropping zones" as “special areas on which balls may or must be dropped when it is not feasible or practicable to proceed exactly in conformity” with the appropriate rule. In the case of water hazards, the appropriate rule is 26-1. The Rules of Golf do not specify the manner in which a drop zone must be configured, as the area must be set up on a case-by-case basis. For example, the famous 17th hole of the TPC Sawgrass course -- home of the PGA Tour’s PLAYERS Championship -- features an island green completely surrounded by water except for a narrow land bridge on the far side of the hole. The 137-yard hole includes a drop zone to the left of the tee area that’s about 60 yards from the green. Appendix I, Part B, Section 8 of the Rules of Golf states that designated drop zones should offer “an additional relief option” to players who’ve hit into a hazard -- rather than being mandatory. Players typically may either use the drop zone or play another shot from the same point as the shot that landed in the hazard. In either case, the relief will cost the player a 1-stroke penalty. For example, if a player hits a tee shot into a water hazard, her next stroke will count as her third, whether she uses a drop zone or hits a second tee shot. At the 2011 PLAYERS Championship, 40 balls were hit into the water at the 17th hole. Only four players hit second tee shots, one of which found the water again (he then moved to the drop zone for his third try). Of the three players who re-teed and hit the green, two secured bogeys while one double-bogeyed. Of the 36 shots hit from the drop zone, five landed in the water. Six players hitting from the drop zone scored bogeys, 15 finished with double-bogeys and 10 suffered a triple-bogey or worse. What Do Red & Black Numbers Mean in Golf ?